Dubai, UAE, October 24, 2018: Ayrton Senna unequalled talent and panache ensured he left a lasting mark on Formula 1, more than any driver before or since. 'Magic Senna' is considered by his peers to be one of the greatest drivers the world has ever seen: three world championship titles (1988, 1990 and 1991), 65 pole positions, and 41 Grand Prix victories. Throughout his career, Senna reinvented a whole new vocabulary of superlatives. Fastest, most agile, smartest... and records that he broke each time. His motivation to win, to push himself and his car to the limits, and his exceptional powers of concentration in the face of intense pressure have shaped his legend, and led TAG Heuer to ask him to be the face of the first #DontCrackUnderPressure campaign in 1991. 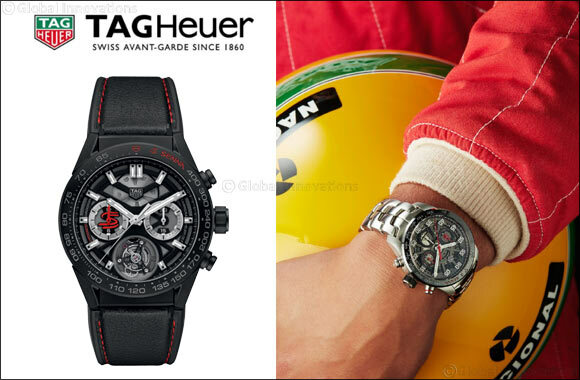 TAG Heuer Carrera Calibre HEUER02 Chronograph Automatic, isavailable with the iconic bracelet with S-shaped links, as adopted by Ayrton at the height of his achievements. It is both an iconic design and a standard bearer in terms of ergonomics and wearer comfort,lending the pieces a racing feel and evoking the exceptional skills of Senna. TAG Heuer Carrera Heuer 02 Tourbillon Chronograph Chronometer, isavailable with a bi-material rubber / calfskin leather strap, and including a black matte tachymeter with SENNA inscription.The Heuer 02 Tourbillon movement was designed and developed entirely at TAG Heuer. This skeleton movement comprises 284 components, within a diameter of 31 mm (13 ¾’’’ [lignes]) and a thickness of 6.9 mm, and beats at a frequency of 4 Hz (28,800 vibrations/hour), boasting a 65-hour power reserve. Special limited Edition of 175 pcs, every watch will be individually numbered. In keeping Ayrton Senna sporty and classy spirit, the two new watches perfectly reflect the spirit of the man who still reflect, today more than ever, the state of mind behind TAG Heuer #DontCrackUnderPressure.